Canadian sphagnum peat moss and wood pulp. Biodegradable. 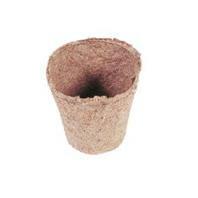 Jiffy/Ferry Morse Seed - Round Jiffy Pots - 3 Inch product is categorised under Wholesale Jiffy Ferry Morse Seed products, Wholesale Lawn & Garden, Wholesale Peat Pot and Seeds.